Volunteers provided cold weather supplies to people without shelter Tuesday night. On November 2, 2018, crews from the City of Houston cleaned up a homeless encampment in Midtown and moved its residents to shelters as they prepare the area to become a bus parking lot. 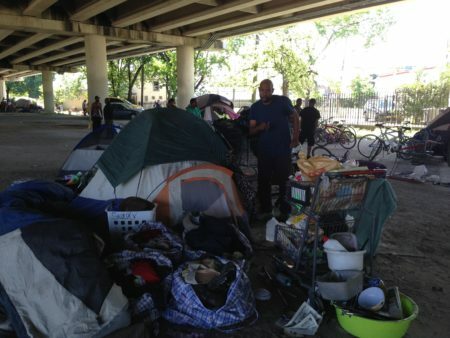 Near-freezing weather in the region has many residents concerned for the Houston-area’s homeless population. Harris County Precinct One opened a warming center Tuesday night at St. John’s Missionary Baptist Church on Emancipation. 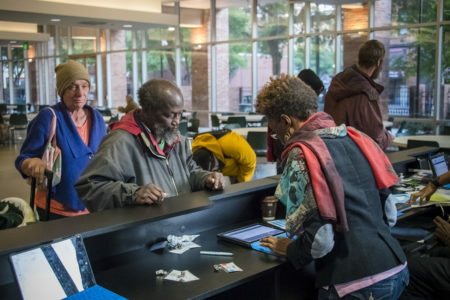 A spokesperson said about a dozen people spent the night there and the center may also be open Wednesday night depending on weather conditions. Volunteers passed out cold weather supplies and hot food as temperatures dropped. 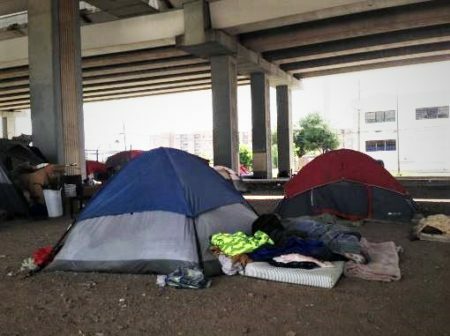 Outreach in the Barrio, a Houston-based volunteer group, raised $2,488 through a Facebook fundraiser for cold weather gear. 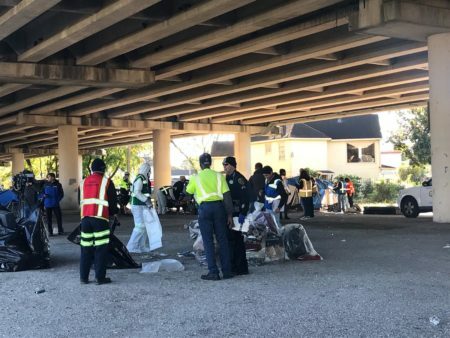 For the first time since 2011, the number of people living without shelter in Houston is up, according to the Houston Homeless Coalition’s latest survey. A big reason for that is Hurricane Harvey — 18% of people the group surveyed said the storm led them to homelessness. The Coalition’s next count and survey begins in 2019. In the next survey, the group wants to see how recovery has progressed, said spokesperson Sarah Brown. “I think that this year’s count will inform us a lot about how our region has recovered and how it will need to continue to recover,” Brown said. Brown says the Coalition is currently recruiting volunteers and finalizing questions for the next survey, beginning in January. Before then, she says, area aid organizations are also taking cold-weather donations.